The most common spinal surgery performed in the dog is for intervertebral disc disease and it is increasingly recognised in cats. The intervertebral discs are cushions between the vertebrae (except the first two cervical vertebrae) that allow movement, they are supportive and act as shock absorbers. Chondrodystrophic dogs, for example the Bassett Hound, Dachshund, Lucas terriers, Sealyhams and Shih Tzus are predisposed to intervertebral disc disease. The most common sign is pain localised to the back or neck. Apart from yelping, common signs of spinal pain are abnormal posture (e.g. hunched back with head down), shivering, panting, unwillingness to move and difficulty jumping / climbing stairs. In more severe cases, there may be difficulty walking – ranging from poor control of the hindlimbs to complete paralysis. The most severe cases are paralysed, have lost bladder function and have lost the ability to feel painful sensations. Disc disease may be strongly suspected on the basis of clinical signs especially in predisposed breeds however diagnostic imaging is required to confirm the diagnosis. Spinal radiographs (x-rays) may reveal characteristic changes of disc disease e.g. calcified disc material within the vertebral canal or narrowing of the IVD space or the foramen however radiographs rarely provide the accurate conformation and localisation required for surgical management. In some cases myelography is recommended. This is a radiograph where a contrast agent (i.e. similar to dye) is put into the space surrounding the spinal cord so that the outline of the spinal cord can be appreciated. 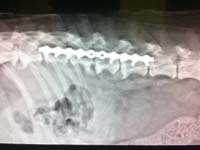 At Gilabbey Veterinary Hospital, we use both xrays and MRI for the diagnosis of spinal cord problems. MRI is less invasive for the animal and provides more information for diagnosis and surgical planning. Many cases will do well when managed conservatively, however, in cases with paralysis the prognosis is better with surgery i.e. the animal is more likely to regain walking function and be pain free; is more likely to improve quickly; and is less likely to have recurrences. Cases where pain sensation is absent (i.e. when the toe is pinched hard but the dog or cat is unaware of discomfort) are a surgical emergency and have a poor prognosis for improvement. Conservative management has the advantage that it is comparatively inexpensive and avoids surgery. The most important aspect is restriction of movement i.e. cage or crate confinement. 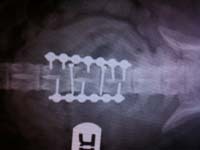 This limits further disc extrusion and exacerbation of the injury. 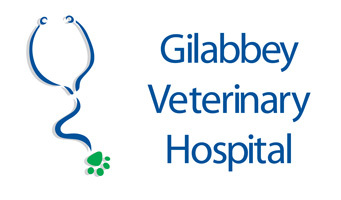 At Gilabbey Veterinary Hospital, our spinal surgery patients receive rehabilitation and physiotherapy from our trained qualified nurses, lead by Deirdre Duggan. When your pet is discharged you will be taught how to perform any ongoing physiotherapy and your pet may continue to have sessions with the physiotherapist or have hydrotherapy sessions in the new centre. 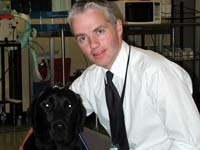 Physiotherapy and rehabilitation play vital parts in the treatment of animals with spinal cord disease.